For full-time workers, it’s a big chunk of your life to write off as nothing but a source of a paycheque. While I too get excited for my evenings and weekends, I think the perspective that the workplace is something to suffer through until you can do other things becomes a self-fulfilling prophesy (and a depressingly gloomy outlook). Before LiveWorkPlay became a job (a great job, no doubt, but don’t be deceived – anyone who works in human services deals with immense stress and needs to actively address issues that can lead to burnout) I worked at an information technology company. The work (such as writing unsophisticated code) was not always interesting or inspiring. Frankly, I don’t remember most of the work I did there, not even outcomes I was quite proud of at the time. What I remember is flashes of gut-busting laughter from co-workers, or particular moments when I needed – or offered – some understanding and kindness. What I’m saying here about the workplace is something I’d extend to life in general. Learn to appreciate and care about your proximal environment – people, places, and things. A lot of our cultural expectations seem to focus “happiness” on “the next big thing.” But that perspective virtually guarantees that the daily joys of life (including the people you share it with) will be under-appreciated. So, if you find yourself lamenting your current situation, be it personal or professional, it’s great to have plans and take action to change things. But I think an often overlooked opportunity for improving how we feel about ourselves and our situation is to consider what actions we could take right now, to make things just a little bit better. Research shows that one of the easiest ways to do this is to do something nice for someone else. 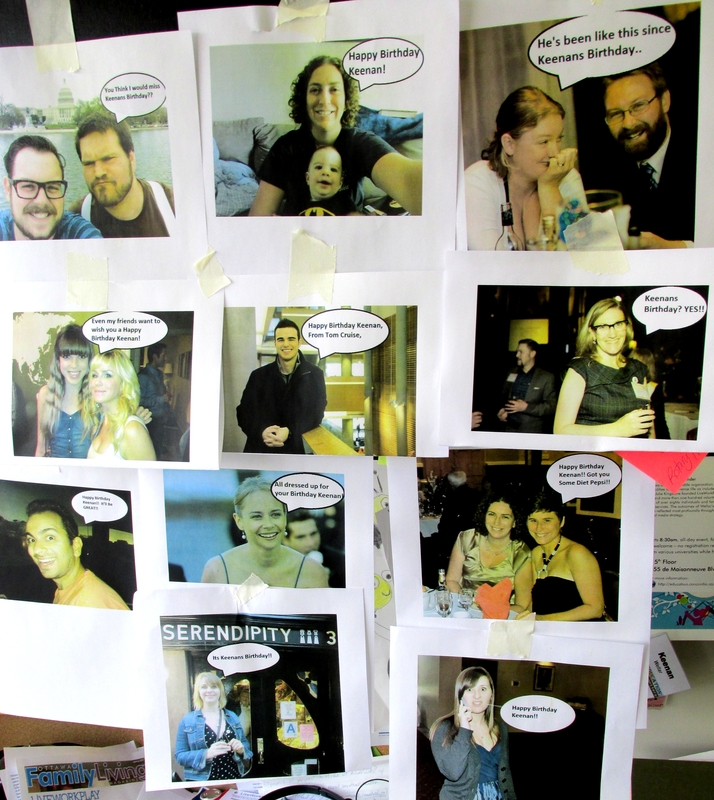 And it doesn’t have to be a grand gesture – in fact, one of my favorite birthday gifts was the lovably goofy collage (above) I received at work! Thanks to everyone – including those I am not in touch with so much these days – who helped me get to 45 and learn how to better enjoy life. This entry was posted in careers, charity. Bookmark the permalink. Great post, Keenan. We have a lot of “Wow, really, I am getting paid to this?” moments in what we are doing these days, but we’ve created the environments and opportunities for those moments. I tell people who work in our field – if you’re not feeling the joy where you are, there are always options – making things incrementally better is one; finding a place that welcomes and celebrates your passions is another. Happy Birthday! Thanks Aaron! You are quite right. While I would like to think everyone can find paid work that they are highly passionate about, I recognize for a variety of reasons this many not be possible or that there might be very difficult barriers involved. In those situations, I think it’s worth a try to think about how to make a less than ideal choice more enjoyable. One thing is for sure, if you feel “stuck” and the only choice you make is to complain and be miserable, then you’ll definitely see your choice realized!